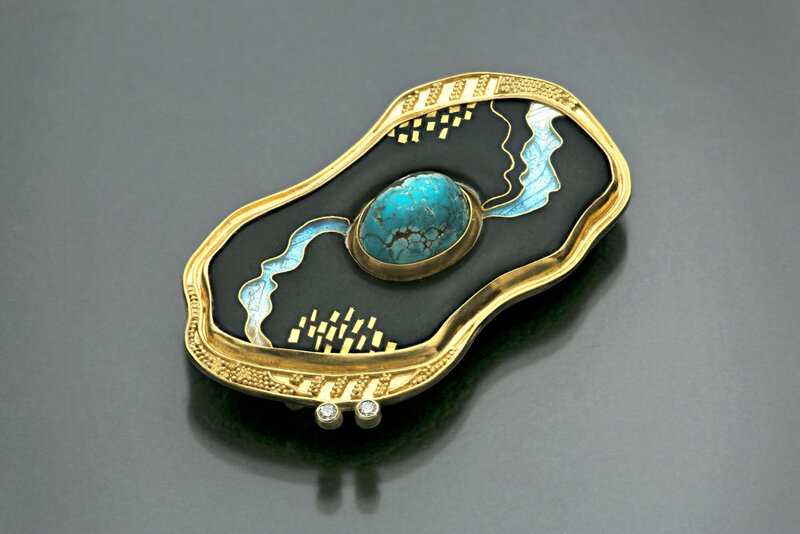 "Streaming Turquoise," a layered enamel piece designed and created by Jennifer Park, won first place in the enamel category at the 2015 Saul Bell Design Awards. All of Jennifer's works, as part of her Wear Ever Jewelry brand, draw discernable, visual connections to the sacred, safe, natural elements of the world. This ranges from streaming aqua rivers to representations of playful-looking tigers. We were given the opportunity to discuss the journey of how she became the award-winning artist that she is today. In her responses, you can see that Park has developed a nuanced and inspiring concept of what jewelry means to her. I was a graphic designer for 25 years and it became very computerized. I wanted to work with my hands again, so I was very attracted to jewelry techniques where metal was manipulated by hammering, sawing, and using fire. I am visually drawn to line and color and that translates very well to cloisonné enameling. I love to draw, so many of my pieces incorporate undulating lines and swirls. My color palette has been jewel tones in purple, fuchsia, turquoise, yellow, and green, many of the colors found in flowers. Earth tones don't really work for me. YOUR 2012 SAUL BELL DESIGN AWARD PIECE HAS A MUCH DIFFERENT AESTHETIC THAN YOUR 2015 PIECE; CAN YOU SHINE SOME LIGHT ON THIS SHIFT IN STYLE? I love the bright, bold colors that I can achieve with the leaded Japanese and French enamels, but while working on my Master's thesis from 2010-2012, I started thinking of jewelry as amuletic—protective elements that are worn on the body. I wanted to use enamel to create portable, protected, spiritual spaces. In my more recent works, matte opaque black enamel surrounds glossy, transparent colored enamel, creating little windows into beautifully clear and serene spaces. WOULD YOU BE ABLE TO ELABORATE MORE ON HOW YOU THINK OF JEWELRY AS "AMULETIC—PROTECTIVE ELEMENTS THAT ARE WORN ON THE BODY?" There is a very long history in virtually all cultures historically of wearing amulets, usually necklaces worn on the body that provide protection for the wearer. In many religions, there has been the practice for pilgrims to carry with them portable altars or pictures of saints. The altars are portable sanctuaries to be carried with the pilgrim on his journey. Carrying a picture of a saint on your journey was another way to gain the protection of the saint. I am using enamel to create a small space that is sacred to me to fortify my journey in life. The opaque black enamel is similar to a rock or fortress, and that surrounds transparent enamel representing a beautiful, light and safe space. This concept is kind of an umbrella that guides many of my significant works. Often, I am inspired by beautiful flowers and wildlife that I abstract into my own little drawings, which are then translated into enamel. The abundance of great photos of plants and animals on the web provides a wealth of source material for me. WHAT PIECE OF ADVICE WOULD YOU OFFER SOMEONE WHO HAS NEVER DONE CLOISONNÉ BEFORE? Be prepared to be patient, because cloisonné involves a lot of steps. I like to plan my design beforehand because it's a lot of work if you don't know what you want it to look like. Make test samples because it is very hard to remove color from a piece. Don't be discouraged if you make mistakes because that is how you learn to do it better the next time. WHAT HAS "DESIGN" COME TO MEAN TO YOU? WHAT DEFINES GREAT DESIGN? Good design should balance elements of color, line, texture, and composition. But a great design to me is one that reaches my emotions, makes me feel something about it. It might be awe-inspiring or breathtaking. It may remind me of something. Often it will make me think, "that's clever; I wish I had thought of that." A great design has a purpose. My bench has a lot of paper towels that contain different projects in progress. I think if it's on the paper towel it won't get lost (not necessarily true). For me, making art is a multi-step process. I have an idea and get started, and then I often need to set it aside (on a paper towel) for a day, a month, or longer to give my unconscious mind time to confirm my plan for the next step. When I rush to complete something, I might end up taking it apart later.